What is New England Base Camp? New England Base Camp is a one of-a-kind outdoor education adventure space. The primary property is located just minutes from Boston yet surrounded by 8,000 acres of wilderness. The program is owned and operated by the Boy Scouts. For over 100 years the Boy Scouts have been known for outdoor skills and leadership development. Now those programs and adventures are available to everyone! So bring your daughter, your husband and your grandparents to enjoy an educational adventure for everyone! Our programs are open year round! Although many activities are seasonal there is always something exciting going on at Base Camp. Climb the 50 foot Ropes Course, learn to shoot Archery or throw Tomahawks, try Bouldering, Rock Climbing or Ice Climbing, prepare for the worst through wilderness survival training, perfect your camping skills, outdoor skills like cooking, ropework and woods tools, learn about the native Americans and make primitive pots, tools and clothing, jump in the indoor Olympic-size competitive pool and more! How much does it cost? Do you have a annual pass available? All those adventures and more are available starting at $15. If someone in your immediate family is a registered Scout you can receive special Scout discounts. If you are Not a Scout but want to be invited to all the additional activities and receive discounts – purchase your Adventure Card. This is your annual pass to adventure and it starts at $50! Click here to learn more! What can my 7 year old do? All our activities are age appropriate, yet everyone can do just about everything. So an elementary school age camper might go rock climbing on the small wall, never much more than 6 feet off the ground, but the older children can go on the big wall, or leave camp on a field trip to the other side of the park for the 75-foot climbing experience. Almost all our activities are scaled to provide an achievable challenge. 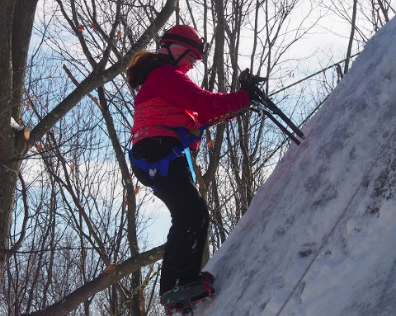 There are a few activities like Ice climbing that require certain physical capabilities, so those activities have age and weight restrictions. Can we buy our lunch there? Or should I bring a lunch for everyone? Yes, we’ve converted our old dining hall into a buffet style restaurant. We provide full breakfast lunch and dinner on Saturdays. If you have a large crowd, order ahead and save! We are always looking to build up our staff. If you are interested in education or the outdoors this is the job for you! We have weekend positions as well as a small number of M-F positions that work with the swimming pool, Home School Network and our school groups. If you're interested in employment opportunities, please fill out the form for Staff or Volunteers and contact Chuck.Blanchette@scouting.org with questions.